THIS IS FOR THE AUDIOPHILE WHO WANTS IT ALL. WE ARE PRETTY MUCH GIVING THE VINYL PORTION OF THIS COLLECTION AS A BONUS BECAUSE OF THE VALUE OF THE HYBRID SACD BOX. Japanese OBI MINI REPLICA BOX SET. WHAT IS A JAPAN "MINI-LP-SLEEVE" CD? Have you ever lamented the loss of one of the 20th Century's great art forms, the 12 vinyl LP jacket? Then "mini-LP-sleeve" CD's may be for you. Mini-sleeve CDs are manufactured in Japan under license. The disc is packaged inside a 135MM X 135MM cardboard precision-miniature replica of the original classic vinyl-LP album. Also, anything contained in the original LP, such as gatefolds, booklets, lyric sheets, posters, printed LP sleeves, stickers, embosses, special LP cover paper/inks/textures and/or die cuts, are precisely replicated and included. An English-language lyric sheet is always included, even if the original LP did not have printed lyrics. Then, there's the sonic quality: Mini-sleeves have dedicated remastering (20-Bit, 24-Bit, DSD, K2/K2HD, and/or HDCD), and can often be superior to the audio on the same title anywhere else in the world. There also may be bonus tracks unavailable elsewhere. Each Japan mini-sleeve has an "obi" ("oh-bee"), a removable Japan-language promotional strip. The obi lists the Japan street date of that particular release, the catalog number, the mastering info, and often the original album's release date. Bonus tracks are only listed on the obi, maintaining the integrity of the original LP artwork. The obi's are collectable, and should not be discarded. All mini-sleeve releases are tremendously limited editions mainly pressed on future orders only and once released immediately out of print. Special VERY RARE LIMITED EDITION BOX SET ONLY PRODUCED ON FUTURES FOR THIS ONE TIME PRESSING -- were only available in Japan. Check out Mymusicfix for additional Audiophile by hitting. To view our current items up on E-Bay. & TYPE IN OBIBOX INTO THE SEARCH FIELD WITHIN OUR STORES SECTION AS YOUR PERSONAL CODE AND ALL INDIVIDUAL TITLES + INFORMATION WILL APPEAR. These are Japanese digitally re-mastered Mini LP replica CDs (the OBI Edition). Limited Japanese box includes FIVE OF the latest HYBRID SACD/DVD Audio CD releases in LP sleeves. Trick Of the Tail , Track Listings. Dance on a Volcano [Audio][Multimedia Track]. Mad Man Moon [Audio][Multimedia Track]. Robbery, Assault and Battery [Audio][Multimedia Track]. Trick of the Tail [Audio][Multimedia Track]. Robbery, Assault and Battery [DVD]. Trick of the Tail [DVD]. I Know What I Like In Your Wardrobe [DVD] [Live]. Fly on a Windshield [DVD][Live]. Supper's Ready [DVD][Live]. "White Rocks" Premiere Programme 1977. Wind and Wuthering, Track Listings. All in a Mouse's Night. Unquiet Slumbers for the Sleepers..
Eleventh Earl of Mar [5.1 Surround Mix][Multimedia Track]. One for the Vine [5.1 Surround Mix][Multimedia Track]. Your Own Special Way [5.1 Surround Mix][Multimedia Track]. [5.1 Surround Mix][Multimedia Track]. All in a Mouse's Night [5.1 Surround Mix][Multimedia Track]. Blood on the Rooftops [5.1 Surround Mix][Multimedia Track]. Unquiet Slumbers for the Sleepers... [5.1 Surround Mix]Multimedia Trac. Afterglow [5.1 Surround Mix][Multimedia Track]. Your Own Special Way [DVD]. Eleventh Earl of Mar [DVD]. One for the Vine [DVD]. And Then There Were Three. Scenes from a Night's Dream. Say It's Alright Joe. Down and Out [5.1 Surround Mix][Multimedia Track]. Undertow [5.1 Surround Mix][Multimedia Track]. Ballad of Big [5.1 Surround Mix][Multimedia Track]. Snowbound [5.1 Surround Mix][Multimedia Track]. Burning Rope [5.1 Surround Mix][Multimedia Track]. Deep in the Motherlode [5.1 Surround Mix][Multimedia Track]. Many Too Many [5.1 Surround Mix][Multimedia Track]. Scenes from a Night's Dream [5.1 Surround Mix][Multimedia Track]. Say It's Alright Joe [5.1 Surround Mix][Multimedia Track]. Lady Lies [5.1 Surround Mix][Multimedia Track]. Follow You Follow Me [5.1 Surround Mix][Multimedia Track]. Follow You Follow Me [DVD]. Reissue Interviews 2007 [Multimedia Track]. Three Dates with Genesis 1978 [Multimedia Track]. Japanese Tour Programme 1978 [Multimedia Track]. Knebworth Programme 1978 [Multimedia Track]. German Festival Programme 1978 [DVD]. Behind the Lines [5.1 Surround Mix][Multimedia Track]. Duchess [5.1 Surround Mix][Multimedia Track]. Guide Vocal [5.1 Surround Mix][Multimedia Track]. Man of Our Times [5.1 Surround Mix][Multimedia Track]. Misunderstanding [5.1 Surround Mix][Multimedia Track]. Heathaze [5.1 Surround Mix][Multimedia Track]. Turn It on Again [5.1 Surround Mix][Multimedia Track]. Alone Tonight [5.1 Surround Mix][Multimedia Track]. Cul-de-Sac [5.1 Surround Mix][Multimedia Track]. Please Don't Ask [5.1 Surround Mix][Multimedia Track]. Duke's Travels [5.1 Surround Mix][Multimedia Track]. Duke's End [5.1 Surround Mix][Multimedia Track]. Turn It on Again [DVD]. Behind the Lines [DVD][Live]. In the Cage [DVD][Live]. Dance on a Volcano [DVD][Live]. No Reply at All [DVD]. Me and Sarah Jane [DVD]. Man on the Corner [DVD]. Like It or Not [DVD]. This Limited Edition Collection has only VERY FEW made world-wide and are immediately Out of Print. Recorded from the finest Original Masters available. Comes with anti-static sleeves similar to Vinyl LPs, Cardboard packaging like an LP, includes extensive Liner Notes Booklet. Actual miniaturized version of the 12inch LP in 4inch CD version. THE SECOND PART OF THIS COLLECTION IS THE VINYL LP BOX - THESE BOXES CAME WITH EVERY THIN PLASTIC WRAP AND THEY ARE NEVER TOTALLY IN TACT. THE BOX IS SEALED BUT DOES HAVE OPENING IN A PORTION OF THE PLASTIC WRAP. THE BOX UNDERNEATH THE PLASTIC IS IN PRISTINE NEW CONDITION. A supergroup that's enjoyed four decades of sustained success and sales of over 130 million albums, Genesis has also won immense critical acclaim and sent both its front men, Peter Gabriel and Phil Collins, on to superstar solo careers. In 1966 by Tony Banks, Mike Rutherford, Anthony Phillips, and Peter Gabriel on lead vocals, the group first rose to fame on the strength of their dramatic progressive rock. Their most successful era, the late'70s through early'80s, came when Collins took over lead vocals - plus drumming and songwriting. The ultimate power trio, the Collins, Rutherford and Banks line-up, took Genesis to new heights of global fame, delivering rock-pop album masterpieces and stadium shows that are now legendary. 1976 - 1982 Vinyl Box Set In 1977, after the'Wind & Wuthering' album, guitarist Steve Hackett left, feeling that he was not getting his fair share of music recorded. The others understood but that wasn't the way Genesis operated. Phil Collins came out from behind the drum kit to be the new singer. The critics wrote them off and mourned the passing of an era. Our next album,'A Trick Of The Tail', doubled our sales.
" "Once we were down to a three piece with Phil as a fully participating songwriter we started writing everything in the studio, says Tony. And the songs tended to be more spontaneous. It seemed to bring out the best in us, individually and collectively. 'Duke' was Genesis' first Number One album in the UK, reaching Number 11 in America and giving them their first Top 20 single there with'Misunderstanding', a songwriting debut for Phil Collins that led to his famous parallel solo career. "'Abacab' was for me a real pleasure to do, " says Mike Rutherford. It was always an adventure we faced without any preconceived ideas. It was,'Here we go, hope it works and let's see which way it takes us'. And Phil's voice had developed. He'd gone from being a drummer who sang to being a great singer. Features: 5LP Box Set Import Remastered in 2007 Selections: Trick of the Tail Side 1 1. Dance on a Volcano 2. Mad Man Moon Side 2 5. Robbery, Assault and Battery 6. A Trick of the Tail 8. Los Endos Wind & Wuthering Side 1 1. Eleventh Earl Of Mar 2. One For The Vine 3. Your Own Special Way 4. All In A Mouse's Night 6. Blood On The Rooftops 7. Unquiet Slumbers For The Sleepers... And Then There Were Three... Burning Rope Side 2 6. Deep In The Motherlode 7. Scenes From A Night's Dream 9. Say It's Alright Joe 10. Follow You Follow Me Duke Side 1 1. Turn It On Again 7. Please Don't Ask 10. Duke's End Abacab Side 1 1. No Reply At All 3. Me And Sarah Jane 4. Keep It Dark Side 2 5. Man On The Corner 8. Like It Or Not 9. COLLECTORS NOTE ON VINYL BOX SET - THE PLASTIC WRAP ON THESE BOXES WERE VERY THIN SO THE ITEM IS STILL SEALED BUT SOME OF THE PLASTIC WRAP IS TORN AT SPOTS. THE ACTUAL BOX SET IS PRISTINE NEW UNDERNAETH THE PLASTIC WRAP. Mymusicfix has been told we have the best collection of Rare, Out of Print music collectibles on E-Bay. OUT OF PRINT PRODUCT is IRREPLACEABLE and therefore NOT RETURNABLE. International Buyers are responsible for their countrys. 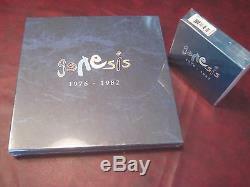 The item "GENESIS 1976 1982 VINYL & JAPAN SACD HYBRID & DVD AUDIO & VISUAL COLLECTION" is in sale since Tuesday, August 05, 2014. This item is in the category "Music\CDs". The seller is "mymusicfix2" and is located in Lake Forest, California. This item can be shipped worldwide.